File photo of Garda checkpoint. GARDAÍ HAVE MADE a number of arrests on our roads in the past 24 hours. In Caherciveen, the Kerry Drugs Unit arrested a driver for drink driving and dangerous driving after their car ended up in a ditch. The driver also had no insurance, Gardaí said on Twitter. Shortly after, another driver in the area was arrested for drug driving and €300 worth of cocaine was seized. 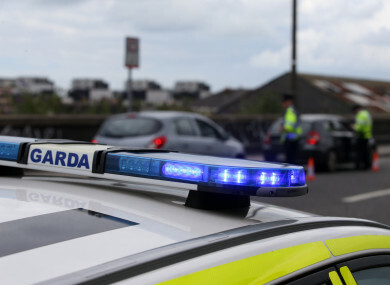 In Limerick, a driver who initially failed to stop for a Garda checkpoint, was found to be six times over the drink-drive limit when they were finally stopped. The vehicle was seized and the driver was held in custody for special sitting of the District Court. The Longford Roads Policing Unit also detected a motorist travelling at 108kmph in a 60-kmph zone at Derrahaun, Co Longford. A fixed charge penalty notice will be issued to the driver. Yesterday, Gardaí in Dublin seized €30,000 worth of heroin and €9,000 in cash as part of on-going drugs operation targeting the sale/supply of controlled drugs in Ballymun. A man in his 20s was charged and appeared before the courts yesterday morning. Email “Kerry driver arrested for drug driving and €300 worth of cocaine seized”. Feedback on “Kerry driver arrested for drug driving and €300 worth of cocaine seized”.